Chemical weathering is a ubiquitous process that has a controlling effect on the minerals observed at the Earth's surface, the chemistry of rivers and oceans, and the morphology of landscapes. Quantifying this effect requires a solid understanding of the mechanisms of chemical weathering at a variety of temporal and spatial scales. A tremendous body of geochemical and morphological evidence, amassed through Martian ground and orbiter missions, points to the past existence of liquid water on the surface of Mars. A major goal of the Mars Exploration program is to understand the environmental conditions under which water existed on Mars, and whether those environments could have sustained life. Alteration mineralogy, as identified on Mars by in situ and orbital spectrosopic measurements, can often constrain the environment of formation and its properties, including the pH and chemistry of fluids and the fluid/rock ratio. However, the instrument suites available on Mars rover missions are limited, and we can't (yet) return Martian samples to the lab for detailed analysis. Therefore, to fully understand the alteration mineralogy we observe on Mars, it is useful to study analogous materials in terrestrial environments in a known geologic context. Clockwise from top left, the Gertrude Weise high-silica deposits at Gusev Crater, Mars; silica coatings on spatter basalt, 1974 Kilauea flow, Hawaii; SEM image of Fe-Ti spherules on the surface of the Hawaiian basalt; cross sectional view of the coating, from bottom to top: basalt substrate, darker silica coating, bright thin Fe-Ti oxide layer, epoxy. Chemtob's recent focus has been the study of Hawaiian silica coatings, as an analog for high-silica deposits discovered by the Spirit rover at Home Plate. These coatings form on very young (~30 y.o.) basaltic flows near volcanic vents. He studied in detail the micro-morphological, chemical, spectral and oxygen isotopic properties of these materials using a variety of analytical techniques. The purpose of this study is to determine the formation mechanism of the coating and to develop a set of characteristic observations for the interpretation of secondary silica on Mars. Chemtob SM, Stebbins JF, Guan Y, Ziegler KG, Hurowitz JA, Eiler JM, and Rossman GR (2011) Insights on formation mechanism of colorful silica coatings on Kilauean basalts from field observations and silicon isotopes. AGU Fall Meeting, EP51B-0841. Chemtob, S. M., G. R. Rossman, K. Hon, and A. K. Matzen (2010) Silica coatings on young basalts at Kilauea, Hawai'i: rapid onset of acid-sulfate weathering. GSA Abstracts with Programs, 42, 162. 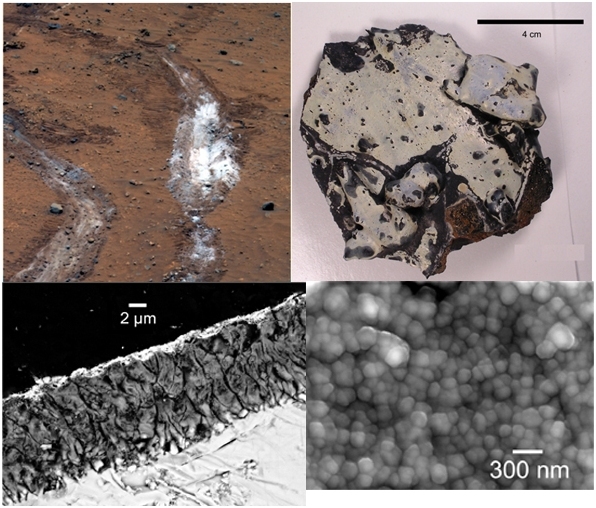 Chemtob, S. M., B. L. Jolliff, G. R. Rossman, J. M. Eiler, and R. E. Arvidson (2010) Silica coatings in the Ka’u Desert, Hawaii, a Mars analog terrain: a micro-morphological, spectral, chemical and isotopic study. JGR, 115, E04001, doi:10.1029/2009JE003473. Chemtob, S. M., G. R. Rossman, J. M. Eiler, and B. L. Jolliff (2009) Silica coatings on the 1974 Kilauea flow: new SEM and SIMS results and implications for Mars. Proc. Lunar Planet. Sci. Conf., Abstract #2156. To assess the alteration mechanism and the mobility of Si during the formation of Hawaiian silica coatings, the silicon isotope composition of the coating materials was measured. The stable isotopes of silicon are susceptible to fractionation during a variety of low-temperature processes. The precipitation of secondary phases such as phyllosilicates and opals from solution concentrates 28Si in the precipitate. The Si still dissolved in the fluid becomes concentrated in 30Si. Because of this fractionation, Si isotopes of natural waters or of secondary minerals have been proposed as an isotopic proxy for the extent of weathering. d30Si for coatings on 1997 Pu'u O'o overflow lavas was determined by ion probe methods. The silica coatings are roughly 1 per mil lighter than their basaltic substrate. The magnitude of this fractionation is consistent with previously measured experimental opal fractionations. The observation that the coating d30Si has changed relative to the basalt again indicates a dissolution-reprecipitation mechanism, and that Si was mobile during coating formation. Tens of percent of total dissolved Si were exported from the system. Recent work involved experimental hydrothermal alteration of basalts in batch and flow-through setups. The objectives of these experiments are to determine the experimental conditions that best replicate Hawaiian coating textures, and to replicate the silicon isotope fractionation produced by acid weathering observed in the natural system. Chemtob, S. M., J. A. Hurowitz, Y. Guan, K. Ziegler, J. M. Eiler, and G. R. Rossman (2011) Silica coatings on young Hawaiian basalts: constraints on formation mechanism from silicon isotopes. Min. Mag. (Goldschmidt proceedings) 75, 649. Mineralogical analysis is a fundamental part of our in situ and remote investigations of the Martian surface. The available suite of spectrometers on MER for determining mineralogy include MiniTES (thermal emission), Pancam (multispectral reflectance imager) and a Mössbauer spectrometer. A shortcoming of these methods is that none is ideally suited for the analysis of fine-grained samples. Attenuated total reflectance (ATR) is an infrared spectroscopic method useful for the analysis of powdered samples. The method uses a high-refractive index crystal such as ZnSe, Ge, or diamond. 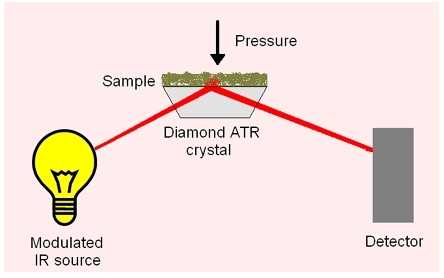 The sample powder is placed in contact with the crystal, and modulated infrared light from an FTIR interferometer is allowed to enter the crystal. The light then penetrates into the sample via an "evanescent wave". Specific frequencies of the incoming radiation, corresponding to the fundamental vibrational frequencies and vibrational overtones of the sample material, are absorbed, and the rest of the light is reflected through the crystal and into a detector. The resulting spectrum is similar to an IR transmission spectrum, but requires less sample preparation. Because of its effectiveness with fine-grained material, ease of sample preparation, and ability to cover a large spectral range, ATR-IR could be an ideal tool for determining quantitative mineralogy on future planetary lander missions. This work has been conducted in collaboration with Prof. George Rossman and Prof. Tim Glotch (Stony Brook U.) to determine if ATR-IR spectra can be used to determine the modal mineralogy of fine-grained mineral mixtures. Past aspects of this project included using a linear deconvolution model (developed by Prof. Deanne Rogers, SBU) to back out the proportions of minerals in a powder mixture, empirically determining the effects of grain size and overlapping vibrational bands. Recent work involved the development of a forward model, predicting the ATR-IR spectra of a powder given its grain size distribution and mineralogical make-up. Chemtob, S. M., T. D. Glotch, G. R. Rossman (2010) ATR-IR spectroscopy for in situ mineral analysis on planetary surfaces: steps toward a forward model. Proc. Lunar Planet. Sci. Conf., Abstract #2198.